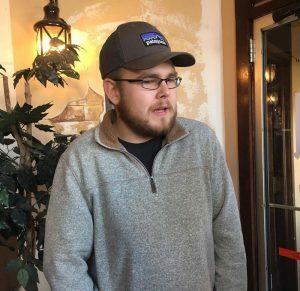 POTSDAM, N.Y. – First-time voter Dameian Bossarte has been working the phones at the Democratic headquarters in St. Lawrence County, N.Y., since early Tuesday morning, trying to get out the vote. 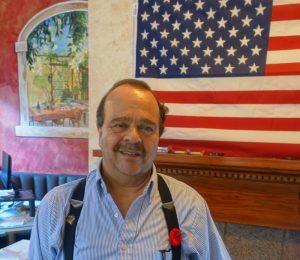 The Democrats of St. Lawrence County, who are running their campaign from an old Italian restaurant in Potsdam, are hoping there will be enough anti-Trump sentiment in this traditional Republican territory to bring victory to candidate Mike Derrick. One new vote will come from Bossarte, who was only 15 when Americans last went to the polls in 2012. 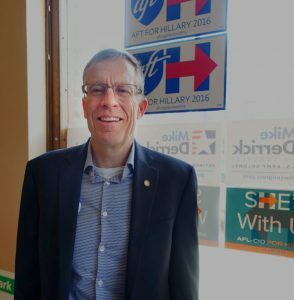 As a volunteer, he says that technology is boosting the Democrat’s organizing capabilities. Campaign volunteers have been filing in and out all day. For Ches Ryan, the Democrat organiser for the 21st District, it’s been a busy. A colourful character with suspenders goes from volunteer to volunteer, shaking hands and introducing himself as Mark Bellardini. He is the chairman for the St. Lawrence Democratic Committee. Bellardini says Derrick is a prime candidate and that the Democratic Party representative. While Derrick may not win the 21st District, Bellardini expects that Clinton will win the presidency. “No matter what, it’s going to be a party all day long,” he says.